If you’re restoring an old motorbike, riding a Harley or even bought one of the cheap Chinese knock-offs, chances are, you’ve got a pushrod engine. While these engines are actually old technology, they still work very well and are extremely simple. Before you can work on these engines and get them tuned properly, you’ll need to understand how they work. Compared to modern overhead cam engines, these are a little different as the cam doesn’t sit above the valves, which is where the pushrods come in. Other than the cam, the engine is similar to a cover head cam engine in most ways, including the crank, which is where it all begins. 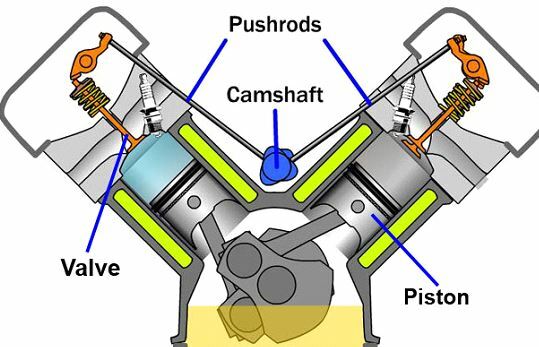 Unlike modern bike engines, there’s no chain around the crack to drive the cam, instead, the car runs off a gear directly attached to the crack, meaning the cam sits just above the crack. To make it as simple as possible, we’ll look at a single cylinder engine, which would have a cam that has only 2 lobes (intake and exhaust). Bigger engines have the same setup, but some have multiple valves per cylinder and there are also engines with multiple cylinders. So, the cam attached to the crank at a ratio of 2 to 1, meaning the crack turns double as fast as the camshaft, allowing the lubes on the cam to turn perfectly to over the exhaust and intake valves, which is exactly the same as a modern engine. Since the cam isn’t directly above the valves, it means it cannot control the valves directly. As mentioned, the cam sits just above the crank, meaning the cam is actually lower than the values. To make it all work, the engine uses tappets that run on the cam lobes and are attached to a push rod, which connects to the valve rocker. Each time the engine turns, the push rod pushes the rocker, which then forces the value to go down and either let air in or out. To ensure the tappet stays connected to the cam lobe at all times and doesn’t stay open or closed longer than it should, the valve has a spring attached to it, forcing it closed and creating pressure on the push rod that’s connected to the tappet and then the cam rocker. Since these engines have more parts involved with the system compared to regular overhead cam motors, there are some disadvantages. You’ll commonly find push rod engines don’t rev nearly as high as overhead cam motors and most can’t understand why that is. Well, it’s rather simple when you think about it. For the engine to run smoothly, the tappet has to remain attached to the cam lobe at all times, meaning the spring that closes the valve has to react fast enough. However, with 5,000 RPM and higher, the spring develops vibrations and simply cannot keep up with the lobes, causing pressure to escape in the engine when it shouldn’t, making you lose power.